That was the margin between victory and defeat for the Boone Central football team Friday night, as the Cardinals dropped a 7-6 heartbreaker to visiting Grand Island Central Catholic at the BC Athletic Field in Albion. In a game plagued by steady rain throughout, points were at a premium and the single digit provided by Austin Witmer’s PAT kick enabled GICC to rally from a 6-0 deficit and eke out the victory. Boone Central’s earlier conversion kick was deflected at the line of scrimmage and came up just short of the crossbar. The Cards nearly rallied in the final minute of play before a Crusader interception dashed final hopes. “We have a number of little problems that are keeping us from getting the job done,” noted Cardinal Coach Arnie Johnson. “Our attitude is good, however, and I think we are working hard. Both teams had problems finishing drives and scoring points Friday night. The host Cardinals appeared to threaten first when Dustin Martin broke a long run that finished inside the GICC 10-yard line, only to have the play called back on a holding penalty. The Crusaders followed with two forays inside BC’s 10-yard stripe, but came up empty each time. Cody Baker forced a GICC fumble at the seven early in the second period and on the visitors’ following possession, Ryan Shotkoski intercepted a pass in the BC end zone. Following that turnover, the Cards came to life behind a bit of trickery. Kalvin Zoucha outjumped a GICC defender to haul in a 23-yard pass from halfback Dustin Martin, sparking an 80-yard TD drive that included consecutive Shotkoski completions of 22 and 11 yards. Senior Dusty Dozler capped the eight-play drive on a five-yard TD run with 1:08 to play in the first half. Boone Central had two great opportunities to expand its lead early in the third period. 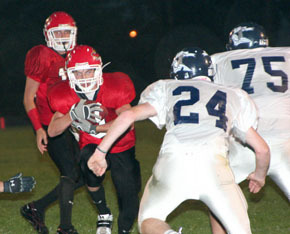 The Cardinals recovered a GICC fumble at the Crusader 31-yard line, but could not gain a first down. Zoucha’s punt was downed at the one and the BC defense forced a Crusader punt that slithered out-of-bounds at the GICC 30. The Cards gained one first down to the 17, but stalled on downs at the 12. The Crusaders gained momentum from the defensive stand and two big pass plays from QB Casey Wiens to TE Adam Brown (33 and 20 yards) quickly moved the ball to the Boone Central 25. Two plays later, Wiens hit Brandon Meyer with an 11-yard TD strike and Witmer drilled the go-ahead PAT kick with 1:28 remaining in the third. The Crusaders tackled Zoucha for a big loss after a bad punt snap and took possession at the BC 41 early in the final stanza. Wiens and Meyer hooked up again for a first down at the 20, but Shotkoski picked off a tipped Wiens’ pass in the end zone to stop the Crusader threat. The teams traded punts and Boone Central mounted one final challenge after taking over at its 10-yard line with 4:24 to play. Two runs by Dozler gained a first down at the 25 and, two plays later, Keir Dane Harner hauled a screen pass to the BC 40. A personal foul penalty advanced the ball to the GICC 45 and Shotkoski scrambled to a first down at the 35 with 2:23 remaining. The Cards jumped on their own fumble at the 29 and two QB sneaks by Shotkoski gained a first down at the Crusader 24 with one minute remaining on the clock. Two pass attempts fell incomplete and Jay Osterbuhr then nailed down the GICC win by intercepting Shotkoski’s third-down aerial with :45 to play.